This recipe is a crowd pleaser. The key ingredient is the crème de cassis — black currant liqueur. It is well worth your while going out of your way to find some. Cook the duck skin side down for another 3 minutes or so and pour off the fat. Flip and fry the other side for 5-6 minutes. Pour off fat and flip again. At this point, you may turn off the heat and set the duck aside on a plate for finishing later. This is convenient if you are having a first course – you can enjoy your starter, finish preparing the duck afterwards (it’s quick) and bring it straight to the table. If you stop the cooking process at this stage, you will need to reheat the pan to medium hot and return the duck to it, skin side down, before continuing with the recipe. Now add the minced garlic to the pan. Add the thyme or rosemary – just the leaves, stripped from the branch. Cook a few more minutes, being careful not to let the garlic burn. Flip the duck again and check to see whether it’s done by slicing into the middle. It should be rosy – if it’s too rare for your taste, cook a bit more. Remove the duck to a cutting board and let it sit for a moment while you make the sauce. Add the cassis and the water or broth to the pan, stirring with a wooden spatula to mix in the drippings from the bottom. Bring to a simmer. While the sauce is heating, slice the duck and place it on a serving plate. Season with salt and pepper. Cover with the warm sauce and serve at once. Serves 2. 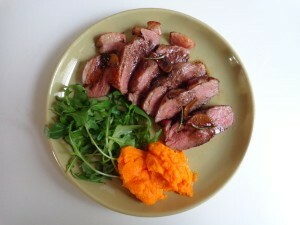 What to serve with the duck? A vegetable, steamed, sautéed or puréed — green beans, zucchini, potatoes, carrots, fennel, whatever you have on hand — or something more sophisticated, like wild rice. This dish pairs well with a full-bodied red like a Rhône wine or a Bordeaux. What can be substituted for the cassis, any other liqueur or something that doesn’t have sugar added? Cognac or any other form of brandy works well with duck. You can also try this recipe substituting a couple of tablespoons of dry rosé for the cassis — or simply omit the alcohol and use homemade chicken broth instead. The juices from cooking the duck will guarantee a rich sauce.